He handed each of us a laminated card as we filed past him. Mine said that my name was Sally Shoreland and that I’d been arrested for aggravated assault …with a potato peeler…against a police officer. That had landed me in the Mebourne city watch house. A watch house is like a city jail in the States — a stop for those awaiting sentencing, or transportation to prison, or sleeping off a drunk and disorderly. This watch house had been built in 1906 and was located between the city courts and the city gaol. 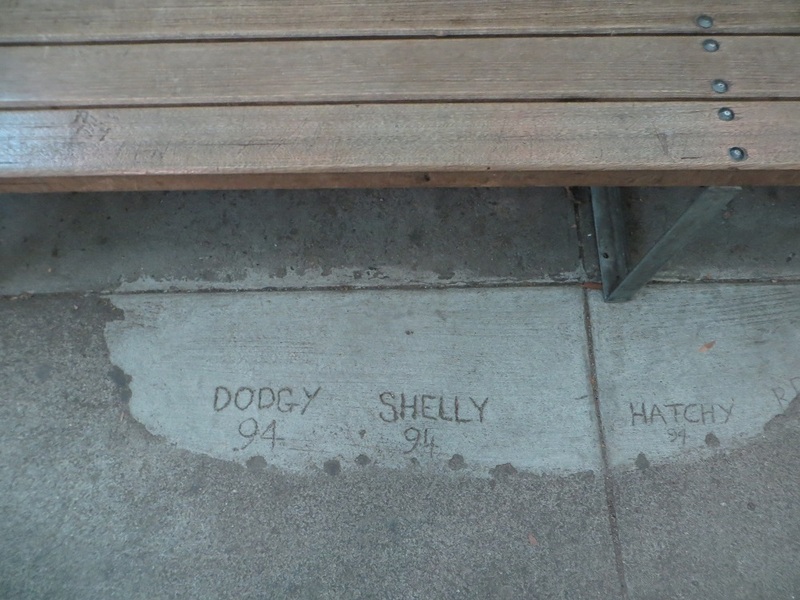 It had closed in 1994 and, left as it was when it closed, was now part of the Old Melbourne Gaol museum complex. I really need to pay closer attention to the brochures, because what I thought was going to be a tour turned out to be an “interactive experience,” where visitors are given a taste of what it was like to be arrested in the 1990s. I’d had one other “interactive experience,” at the Driehaus Museum in Chicago, where I’d been a ladies maid trying to get a job at the 19th century Driehaus haus. It was there I learned that interactive experiences are not for me. But here I was, having once again paid to be treated like dirt. “Bent over, put your hands through your hair and shake them. Stand up. Open your mouths. Put up your hands. The only words I ever want to hear you say are ‘Yes, Sergeant’ and ‘No, Sergeant.’” Fifty shades of annoying. Thankfully, intake didn’t last long. We were put into cells (women – about 10 of us — in one, men in another), the doors closed and the lights turned off. The effect would have been scarier if there hadn’t been some light seeping through a grate above the door. After the cells came the men’s exercise yard (the women’s part had long been torn down and made part of a neighboring university). Prisoners spent 12 hours in their cells and 12 hours in the exercise yard, no matter what the weather. There was one toilet in the yard and its flushing mechanism was in the administrative office. It was a way to maintain discipline, Fake Sergeant told us. Behave, and we’ll think about flushing the toilet. The entire watch house experience lasted about 45 minutes and as much as I didn’t care for the interactive part, it did provide “I had no idea” information about jails to very naïve me. And made me grateful that it was as close as I’m ever likely to be to an arrest. 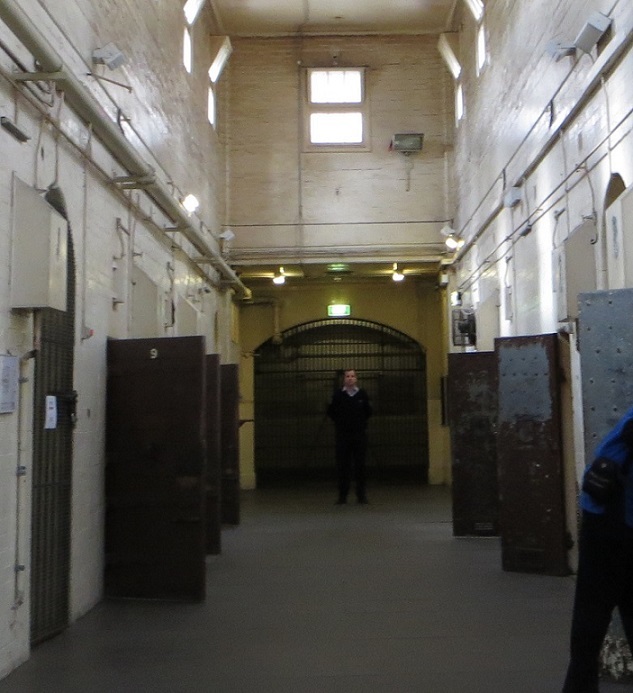 Gallery | This entry was posted in Victoria, Australia and tagged Melbourne City Gaol, prison tour, Watch House Experience. Bookmark the permalink. I understand that there is a similar experience to be had in Riga in Latvia and people actually pay to spend a night in a ex communist regime prison cell complete with all the unpleasantness. Personally I’d rather pay to stay in a hotel! I think I’ll take on pass on that one too. That’s a little too interactive for me! Me too. It wasn’t quite as benign as the Dreihaus experience. Good to hear that you were scared straight, and that maybe next time, you will put down the potato peeler. Hopefully no one on the tour had to use the bathroom! I’ve learned my lesson, now that I’ve done some hard time. Why is it all these interactive experiences are always for something horrific? They always want you to experience being enslaved or encarcerated, or part of the abused working poor? Where’s the experience of being the wealthy lady of the house with nothing to do but dress, eat, walk in the garden and socialize? OK, maybe have to boss the servants a bit, but still. I’d sign up for that one!! Lol. I’ve never come across one of those if I do, I’ll be the first one to sign up. Having some gap in travel experiences, so I’m reposting some of my favorites. I didn’t realize there was that type of interactive experiences. The only ones I’ve had are churning butter and milking a cow. And making pretzels. It seems that interactive, immersive experiences at museums are a “thing.” The prison experiences are the ones that I hear about the most. Not recommended, though. I’d much rather milk a cow or make pretzels (as long as you got to eat them after you made them).